CLINICAL AND MICROBIOLOGICAL DATA IN PATIENTS WITH CHRONIC PERIODONTITIS. Christina Popova1, Velichka Dosseva-Panova1 , Vladimir E. Panov2. 2) Department of Conservative dental treatment and Pediatric dental medicine, Faculty of Dental Medicine, Medical University - Varna, Bulgaria. Periodontitis is an infectious disease concerning supporting tissues of the teeth. The primary etiological agent for disease development and progression is the subgingival biofilm, but recently it is known that host factors may modify the pathological process or may affect the severity and /or extent. The increasing levels of some specific pathogenic subgingival bacteria such as Aggregatibacter actinomycetemcomitans, Porphyromonas gingivalis, Treponema denticola, Tannerella forsythia, Fusobacterium nucleatum, Prevotella intermedia and others can result in periodontal destruction and possibly correlate with disease severity. Data from controlled studies show high prevalence of P. gingivalis, T. forsythia and Tr. denticola which represent the red complex (coexistence of these three species) in patients with moderate and severe chronic periodontitis. Parallel investigation of probing depth (PD) and clinical attachment level (CAL) with the microbiological testing may give a confirmation of relation between subgingival pathogenic bacteria and severity of periodontitis. Key words: periodontal pathogens, chronic periodontitis, clinical periodontal examination. Popova Chr, Dosseva-Panova V, Panov VE. Clinical and microbiological data in patients with chronic periodontitis. J of IMAB. 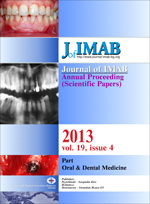 2013; 19(4):313-316. doi: 10.5272/jimab.2013194.313. 8. Sanz M, Lau L, Herrera D, Morillo JM, Silva A. Methods of detection of Actinobacillus actinomycetemcomitans, Porphyromonas gingivalis and Tannerella forsythensis in periodontal microbiology, with special enphasis on advanced molecular techniques: a review. J Clin Periodontol. 2004; 31:1034-1047. 11. Yano-Higuchi K, Takamatsu N, He T, Umeda M, Ishikawa I. Prevalence of Bacteroides forsythus, Porphyromonas gingivalis and Actinobacillus actinomycetemcomitans insubgingival microflora of Japanese patients with adult and rapidly progressive periodontitis. J Clin Periodontol. 2000 Aug;27(8):597-602. [PubMed] [CrossRef].